We love the challenge of working with modest sized spaces to fulfil our clients’ dreams. 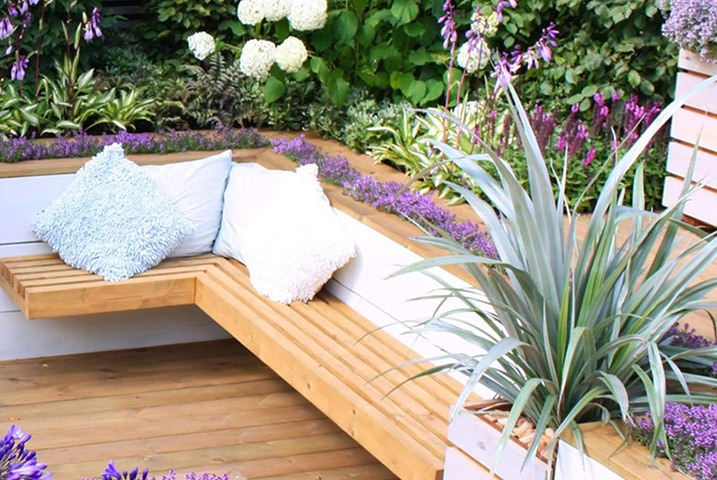 Whether you have a rooftop, balcony or a small London garden we combine our knowledge of geometry and architecture with good old fashioned hard work to create your custom garden design. 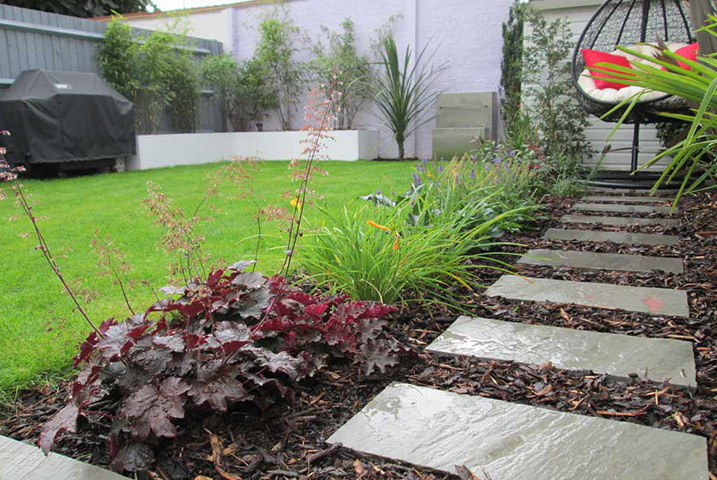 We design courtyard gardens using a pastoral colour palette with an overall subtlety in mind. This goes hand-in-hand with an absence of any central focus, which allows a sense of spaciousness and tranquillity to prevail. No part of the design is inessential. 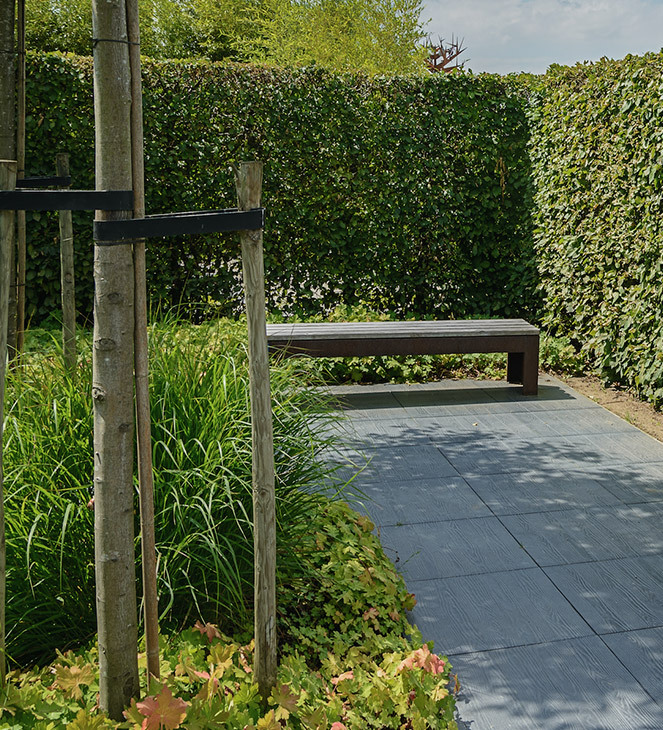 The choice of a tiled surface in a small urban garden design like this also helps to open up the space and we think it makes an ideal setting for socialising with friends and family. This design is a favourite in and around London, while in Surrey and the surrounding counties, bolder styles tend to be more popular. 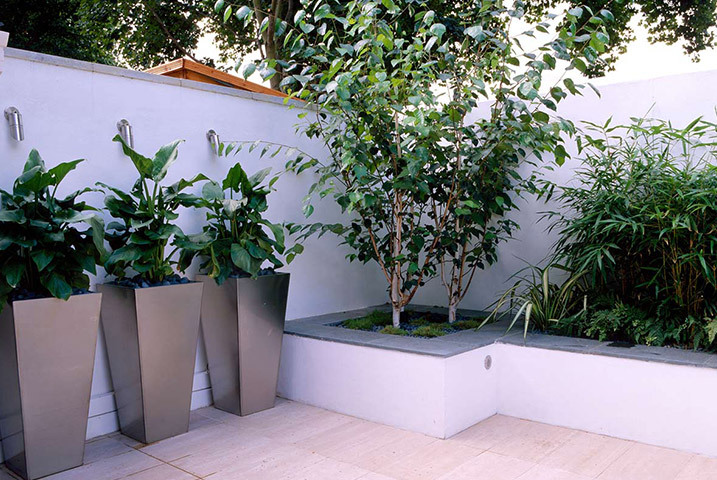 Small garden designs in the UK often borrow from continental forms. But it’s important to get the balance just right. When it comes to Mediterranean garden designs, for instance, some tend to rely too much on gravel. 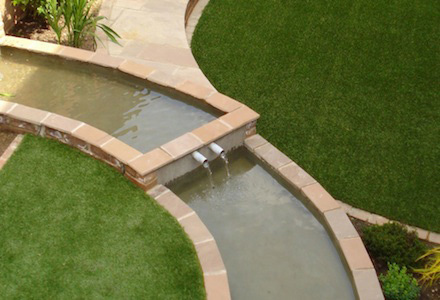 We prefer to include as much green as possible to create thriving oasis in your back garden. Here, grasses around the water feature have been planted to complement the paving and the tall tiled screen. We’ve also used hardscaping features, like the screen and its differing colours, to give the illusion of a much bigger space. 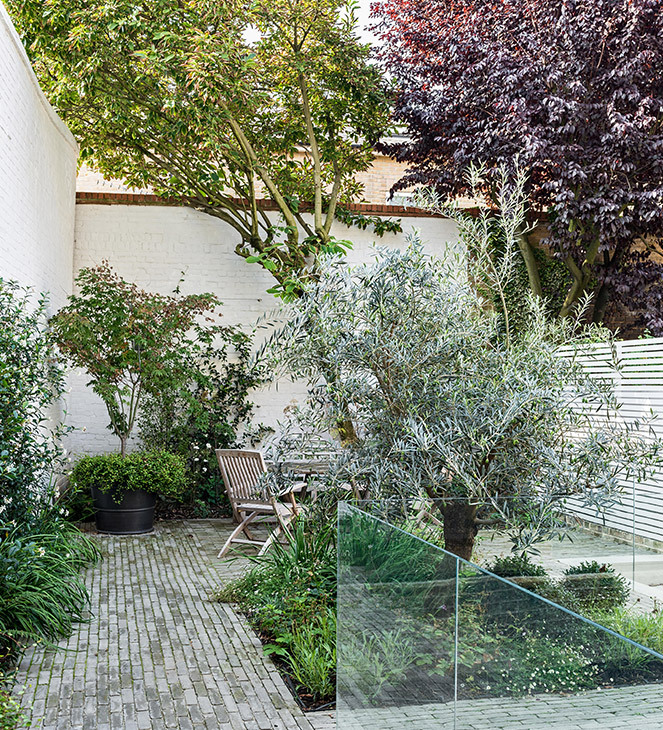 Small London garden design is all about the illusion of space. Often, we accomplish this with dividing lines and areas of interest to attract and direct the gaze. In other words, as the eye drifts from one focal point to another, the garden should appear larger than it is. This effect isn’t easy to achieve. We start by identifying your existing fixed utilities, such as sheds, barbecues, and seating areas. And then we consider the best way of planting around them to get the impression we want. These are just the basics of how to make small gardens look bigger. 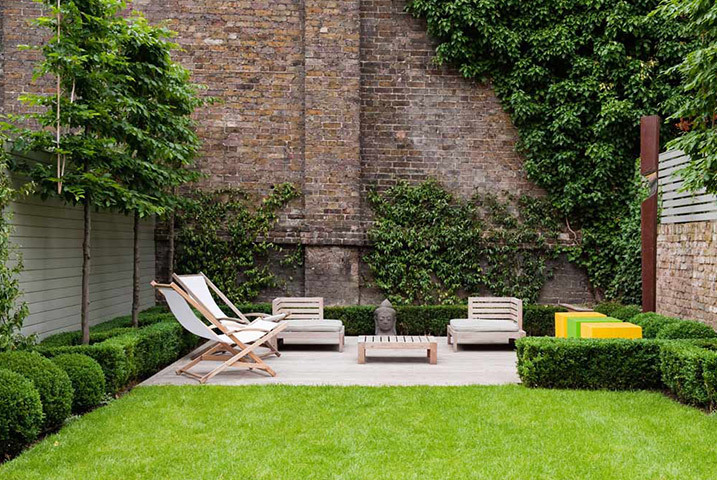 It’s a good idea with narrow gardens to keep furniture to a minimum. You can just use bean bags and folding chairs if needs be. 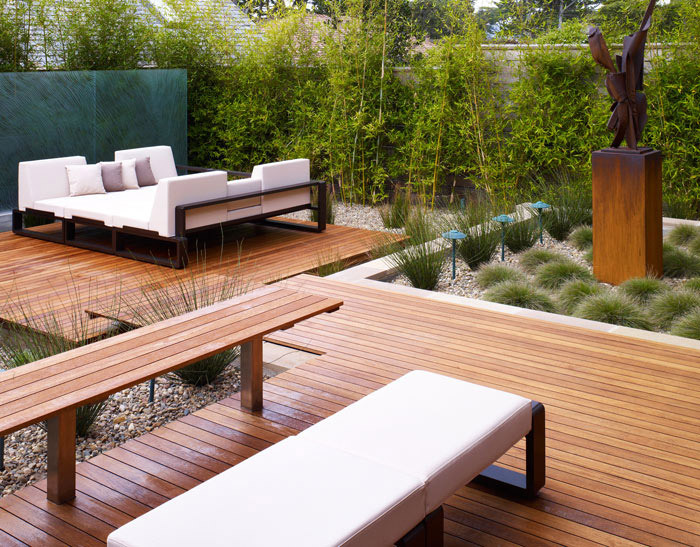 That leaves you to focus on using pure garden design elements to open up the space. Here, we’ve surrounded a central island of shrubs and trees with light slabs and an angular hedgerow. It has the feel of a miniature, contemporary-meets-traditional expanse. The modern-but-aged outdoor fireplace completes this effect. 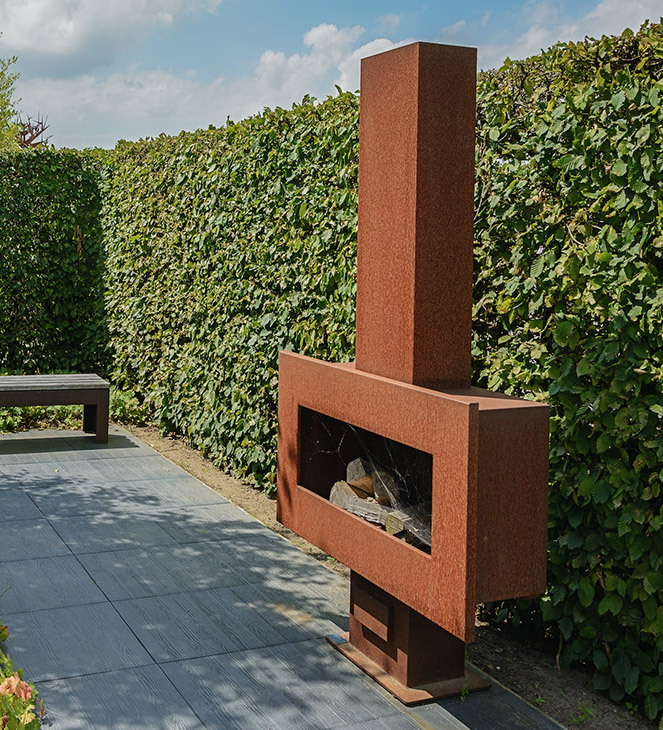 It serves not only as the focal point, but with its contemporary form and rustic colour it’s a touchstone for the theme of the garden. 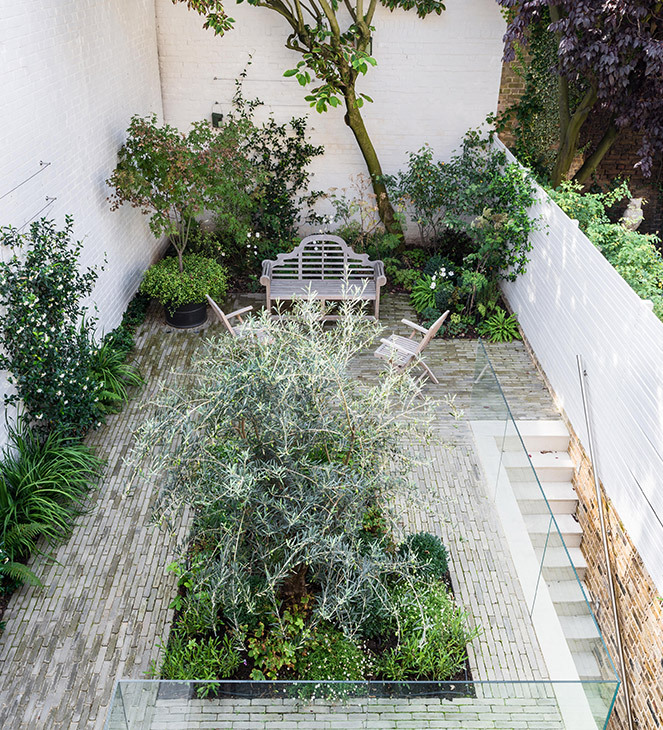 This modern Victorian small urban garden transformed is definitely one of our favourites. In fact, it shows the advantage OF small gardens. The simple elegance and unique ambience that has been created in this design would be tricky to replicate in a larger space. Crucial for any Victorian garden is good quality paving stone. You’ll see it in most Victorian garden design pictures in the UK. 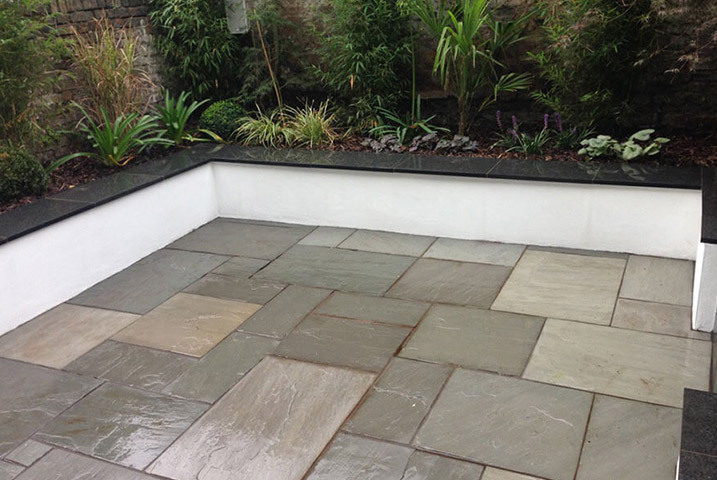 Traditionally, paving or lawn space would be framed with box hedging, stonework, and flowers if space allows. Here, we’ve upgraded that simple tradition with contemporary flourishes. There’s a tendency among our clients to see an uneven garden as a drawback. Many seem to think variable heights are a poor blank canvas to work with. But, as garden designers, we look at them as an opportunity. 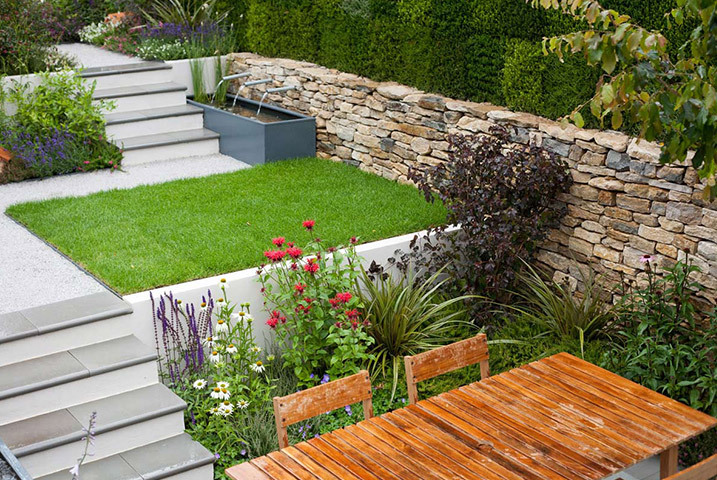 You can see in this small garden design that existing height differences provide a framework to separate spaces. And we’ll bring these genuinely interesting forms together with any kind of theme you like. 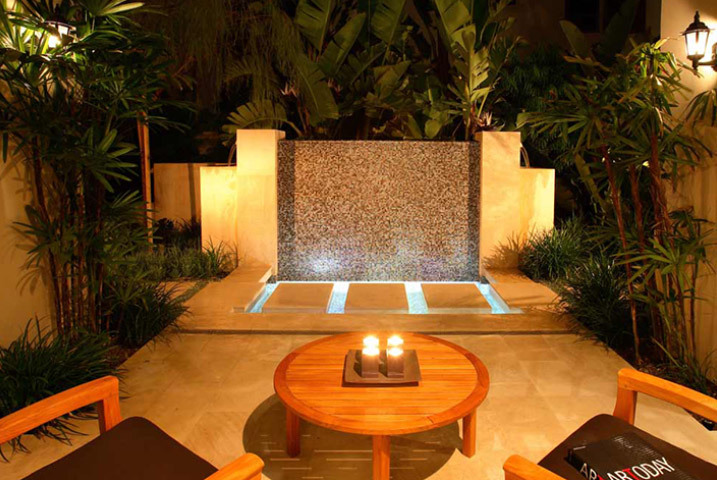 The lawn, water feature, steps, and levels all have a sleek, modern feel. 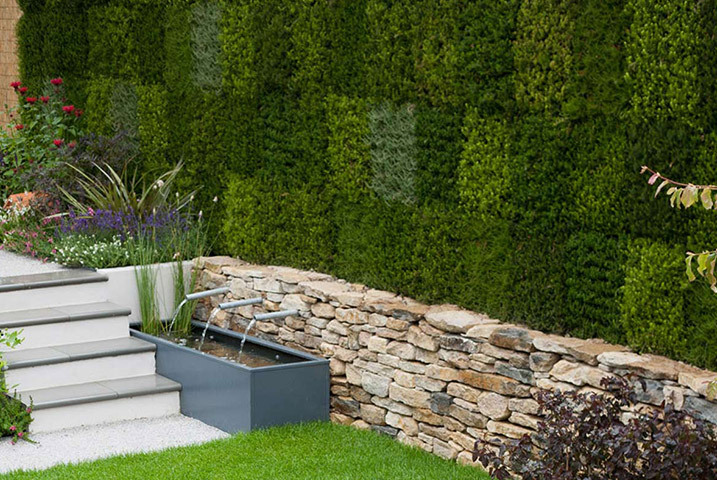 And the box hedging adds fresh visual interest with a patchwork of differing greens. 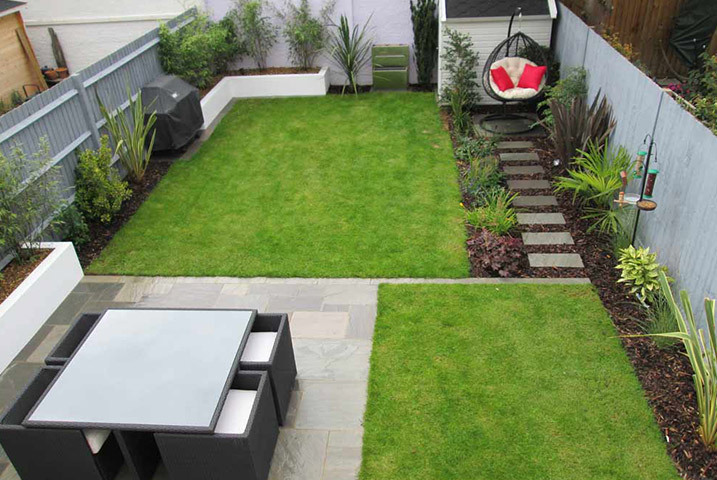 Small garden designers often use the concept ‘less is more’. Less clutter, in other words, allows for more style and serenity. Here, we’ve gone for clean geometric lines and a breezy, minimalist palette. You can see that the simple green and white colour scheme is at once cooling in the summer and brightening in the winter. And it opens up the space all year round. Meanwhile, we decided to include the metallic vases and water feature to help bring it right up to date. 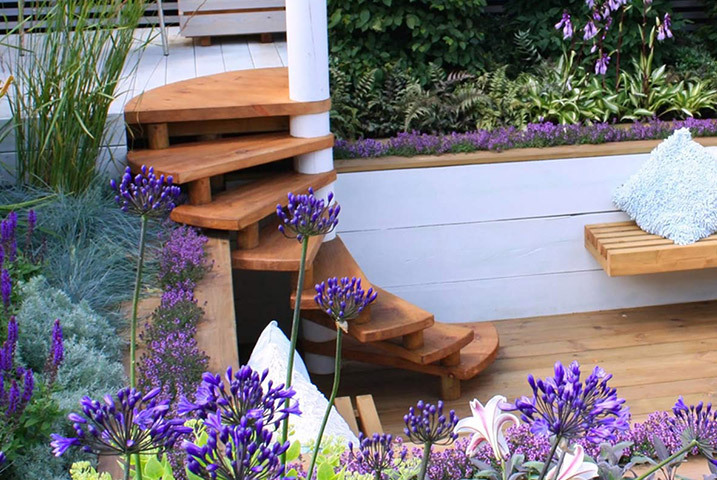 This beautiful garden has the added advantage of being very low-maintenance. 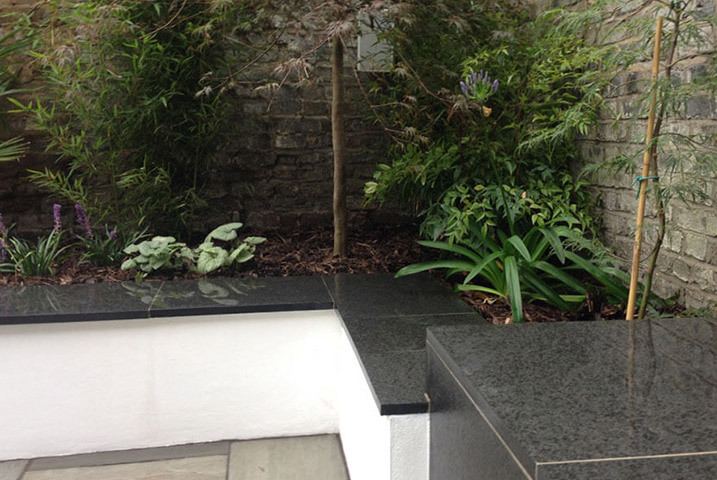 For this small garden design in London, the client requested no lawn so we used a less calibrated stone (a stone with diverse sizes and colours to preserve some of the gentleness lost. This works especially well with our client’s own choice of planting: Bright and textured with plenty of green, which also does a great job of obscuring the boundary wall. 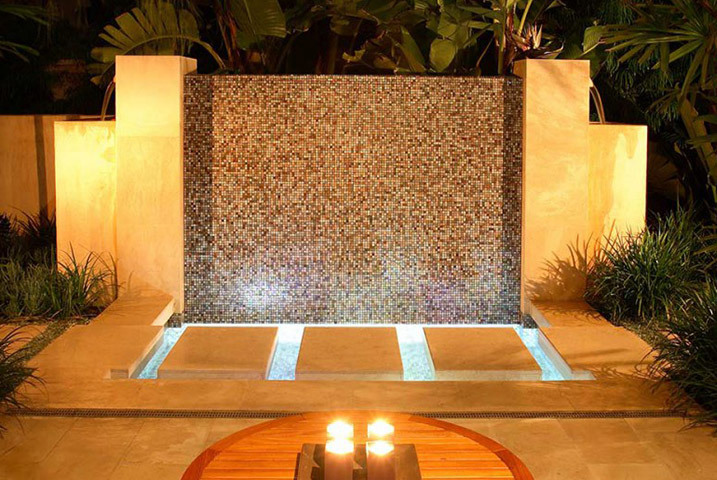 We designed this as a garden specifically for entertaining, as the client requested, and created space for guests and all they might need. But we managed to keep a natural ambience. We think this design looks fantastic with its quirky bijou feel. This is what making the most of a small garden is all about. By including a variety of textures, forms, and colours, there’s plenty for the eye to take in. When choosing plants for a small garden, it’s essential to avoid bright, loud colours such as pinks and reds, which will overpower restricted spaces. And we didn’t want to make it too busy so we’ve opted for purples and blues, which still create depth and interest. The natural shade of the decking balances the dazzling white of the artificial rendered wall. The use of architectural plants in blocks like grasses here sits well with the minimalist theme and is much better than planting a mass of vegetation. 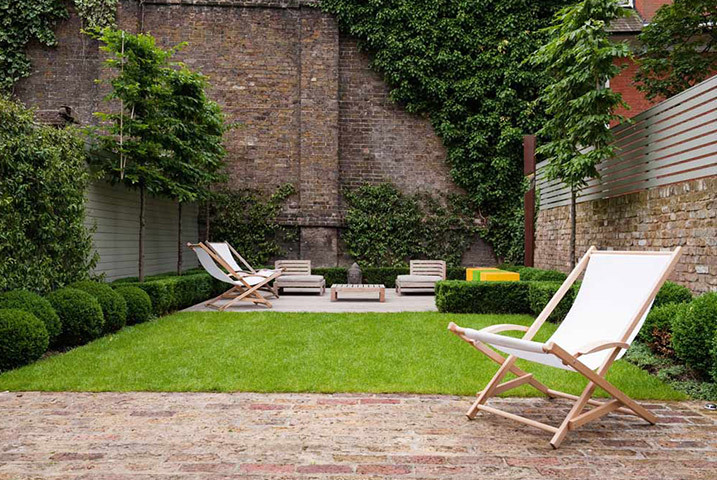 These small gardens in London are also low-maintenance. 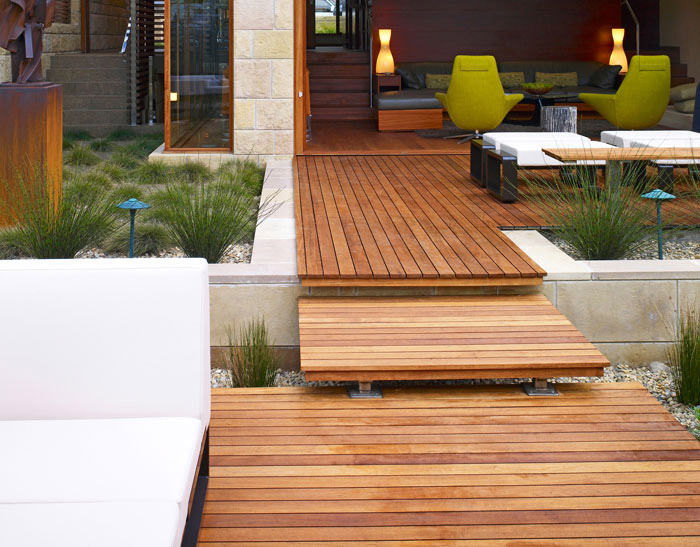 However, if it hadn’t have been softened the effect with the natural wood decking, it could have easily looked austere. The movement of the leaves brings the garden to life, which adds to that connection with nature, which is always a necessity when the house could over power a garden. This is an excellent example of how we achieve that balance. 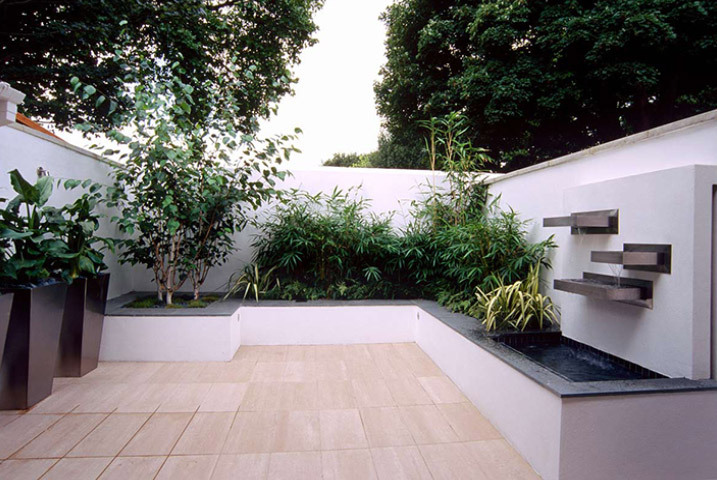 With this small garden in London we created another great example of how curves give the impression of space. Our brief here was two-fold: To include an area of astroturf and to make use of the existing levels. The curved walls nicely divide the space while concealing just how small it really is. And the flowing water between them give a sense of continuous movement. 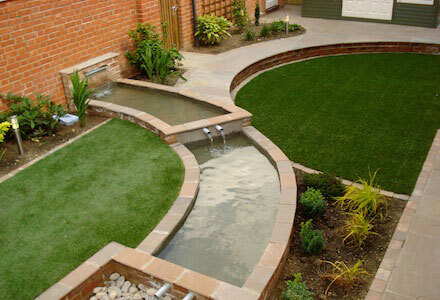 In fact, water features are often key elements of modern garden designs for small gardens. The sound of running water creates an atmosphere of peace and tranquillity—in turn clearing space in the mind.